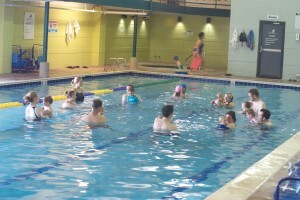 Group Swim Lessons are for children 3 years & up and are separated into levels after individual assessment. Our instructors guide children through a series of skills designed to keep them comfortable in the water and teach proper technique of each of the four competitive strokes. For detailed information or if you have questions about swim lessons at Raintree Athletic Club please email swimlessons@raintreeathleticclub.com. **Sign up for 2 days/week and receive a 10% discount on the session! If your child can perform everything listed under one level, they should move up to the next level. Learning how to enter/exit the water safely; Feel comfortable in water; Front & Back floats w/ assistance; Explore submerging face into water. Float without support (front/back); Exiting the pool without the ladder or stairs; Float from vertical (front/back); Freestyle arm and leg action (5 feet/lane line); Float flip. Back float from side jump in; Finning- side arms & flutter kick leg action; Streamline (front/back)- flutter kick; Freestyle- combining arms & legs 25M; Backstroke- combining arms & legs 25M. Freestyle with side breathing 50M; Strong smooth kick on back 25M; Backstroke 50M with toes out; Breaststroke kick introduction.